CACH is a registered wildlife charity and public benefit organisation whose accounts are audited every year. We are a group of volunteers who campaign together to secure a ban on captive breeding of lions for the canned hunting industry. There are no paid employees in CACH. No one draws a salary, nor even the directors. All funds raised go to meet campaign expenses. After a legal career as an Advocate in Zimbabwe and Botswana, Chris came back to Sou th Africa in 1984, and decided to retire from the law. He farmed in the Western Transvaal for ten years, before he and Bev moved to the Kalahari to establish a wildlife rehab centre and Sanctuary. He claims that he was dragged in to animal welfare work by Bev, who had the dream of founding a wildlife sanctuary. Once they were working hands-on with rehab wildlife, he became sensitised to the suffering of animals. So when the Cook Report exposed the shocking cruelty of the canned hunting of lions, he made up his mind to spend the rest of his life campaigning for the abolition of canned hunting. That is how CACH began. Bev was born in Durban. She worked at a security company and then in real estate. In her 30's she sailed across the Atlantic in a small yacht from Cape Town to America. More recently she spent a month volunteering on the Sea Shepherd ship Steve Irwin in Melbourne. But the hardest, and most valuable years were those spent rescuing birds and animals in the Kalahari. Her life's ambition is to see the breeding of lions in captivity abolished and canned hunting banned in SA. Bev died of cancer on 30th April 2016. 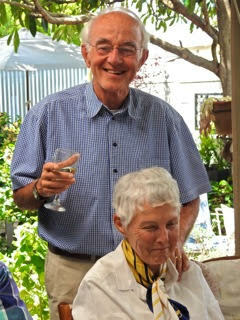 After retiring to Wilderness in the Cape, Chris and Bev kept busy building the NGO which they founded, called the Campaign Against Canned Hunting. The Global March for Lions on the 15th March, 2014 has bought together some of the most talented and dedicated people in animal welfare. CACH has now gone GLOBAL. We are proud to welcome the following members and representatives to CACH. David is a recognized technical author and expert in the fields of technology and online business. His books have been published globally and are recommended reading at leading institutions like MIT. In his spare time, David contributes to conservation and environmental causes by helping out with CACH. Ronnie & Trish Board - S.A. I had extensive experience in the commercial world as an accountant ending up as Financial Director of the then largest advertising agency in South Africa. Semi retired to Wilderness; I have been undertaking work as a tax practitioner, accounting services and administering deceased estates. I am a member of the South African Institute of Professional Accountants. Trish worked in the United Building Society where I met her in 1969. After we decided to start a family we took the decision that she would become a “home executive” ensuring that our children had a meaningful upbringing. Trish is a talented stain glass artist and recently donated a show piece work to a Buddhist Retreat in Natal. We have lived in Wilderness for 17 years, love nature and are passionate about the well being of all sentient beings, specifically those that cannot protect themselves against the callousness of man. We abhor the senseless activities that have encroached into societies all around the world and have more often than not felt that the opposing forces were fighting a losing cause. Living and working in Padova. Degree in Soil Science and Farming. Actually working for a Big-Pharma. Actually working at the Padova University in a Medicine Department. 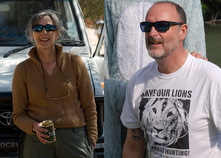 Both of us passionate travellers and nature photographers in Africa. Our Parks, until now: Serengeti, Ngorongoro and Tarangire in Tanzania. Mana Pools and Hwange in Zimbabwe. Kruger,Marakele,Pilanesberg,Augrabies,Richtersveld and Kgalagadi ( 4 times) in South Africa. Chobe,Moremi,Savuti, Central Kalahari, Nxai Pan in Botswana. indeed lucky to have persons of this calibre in our team. A first-class honours student at school and Sorbonne university, Julie has a postgraduate degree in animal behaviour. She won awards for her creative work for major advertising agencies, working for world-famous brands. She rose to the position of creative director. From 1993 onwards she set up as Consultant in advertising for clients involved in green business and humanitarian work. She has travelled and worked widely in conservation in Kenya, Malaysia, Borneo, Sri Lanka, India, Tanzania, Namibia, Brazil and Malawi. 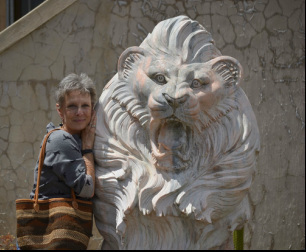 She has also done volunteer work on many different species of wildlife, from Cape Griffon vultures to the big cats, lions, leopards and cheetah. I was born in 1975, I´m married and I live in a tiny village near Heidelberg, Germany. Since 1996 I work in an adult education institute. Since earliest childhood my parents taught me to respect animals and to see them as sentient living beings. Sanctuary for captive born predators where we worked as volunteers in February 2017. We are going to volunteer once again in April (2018) and we are very happy to be a part of the Drakenstein Lion´s Park team. wolves are my absolute favorite animals. Les has been managing Trustee of the Marchig Trust for many years, and has received the MBE from the Queen for his services to animal welfare. Madame Jeanne Marchig of Geneva, because of her deep concern for nature and animals and in memory of her husband, the painter Giannino Marchig. The objects of the Trust are to protect animals and to promote and encourage practical work in preventing animal cruelty and the relief of animal suffering. These objects are pursued by the Trust in two ways, Grants and Awards. David is based in Edinburgh,Scotland, and is supporting Malena our Scottish rep. He hadn’t heard of canned lion hunting at all until the October march in Edinburgh, and was appalled to learn of its existence and astonished that anyone could even pretend something so cruel and devoid of skill could be called sport. He is a regular visitor to South Africa having fallen for the people, the wildlife and the wild landscapes (especially the Klein Karoo) on his first visit 9 years ago. David’s wife Marysia is currently helping with an innovative community project - the Kariega Project - in Kenton-on-Sea near Port Elizabeth which gives them even more excuses for visiting South Africa! Despite having studied History of Art, David has had a long career as a UK government and private practice lawyer specialising in public sector infrastructure projects (roads, bridges, schools etc), public procurement and legislation. He is now semi retired and making time to help CACH. He is also a supporter of, in particular, the Big Life Foundation, the David Sheldrick Wildlife Trust and Compassion in World Farming. I am originally from sunny Sweden but got so charmed by Edinburgh during a holiday that I ended up moving to here. I have spent many years travelling and working in Hospitality but currently I am doing a BA Hons in Photography at Napier University. This summer I am also taking an Animal Welfare summer course at Edinburgh Uni. I am the photographer for the local Greenpeace group and have also done work for other environmental groups in Edinburgh. My many cameras as well as animals are my greatest passions in life. I hope to one day combine the two and use my photography in wildlife conservation work. I have always loved big cats and specially lions. When I last year saw the image of Melissa Bachman grinning over the dead lion something happened within me. I could no more sit in silence and let monsters like Bachman and other trophy hunters violate nature! I started a project against trophy hunting called ‘Scotland Roars’ and came in touch with Global March For Lions via Twitter. Like most in Scotland I had never heard about canned hunting. I was absolutely shocked and disgusted, and I ended up organizing the Edinburgh march to raise awareness about it. On the day I met many other animal defenders and I decided to carry on campaigning for lions and for a ban on canned hunts in South Africa. Becoming a member of CACH was a great honor and alongside with ‘Scotland for Elephants’ I am planning the next global march plus various events in Scotland. Having travelled throughout her life the most defining and memorable moments have always involved animals. Even as a very small girl she can remember telling her father and his friend that riding turtles off a remote beach was “interfering with nature!” A passionate advocate for sentient beings, she has always held a deep love of animals. Donalea possesses a background in corporate business with more than 30 years experience in design for both Australian and International companies. Her first senior position was Director (at the age of 24) for a design group owned by Australian public company Elders Resources. More recently a practising interior designer she recently founded For the Love of Wildlife to create a professional platform to campaign the plight of animals in Africa, Australia and New Zealand, raising awareness of the destructive forces annihilating wildlife. For the Love of Wildlife has been instrumental in working with the Australian Government in banning the importation of trophies and body parts, banning rhino with the announcement on lion expected 2015. By banning imports it takes the incentive away from those that participate in trophy hunting, simultaneously running an awareness campaign for Australian volunteers that are conned by the captive breeders and canned hunting industry. Donalea resides on the outskirts of Melbourne, living in the beautiful forests of Mt Dandenong. Faye is originally from Belgium, but lived in France and the UAE and is now settled in a tiny village in Germany. She has been a senior marketing executive for 25 years and is now working as a manager in dermatology. Faye has always had a passion for anything that resembles an animal and started as an activist during her time in the Middle East – a region where animal welfare is virtually unheard of. She does not eat meat and tries to cut down on wool and leather. She firmly believes in Thomas Edison’s words: ‘Non-violence leads to the highest ethics, which is the goal of all evolution. Until we stop harming all other living beings, we are still savages’. However, she fears that since the industrial revolution, the sole purpose of evolution has evolved to the gathering of money and property. 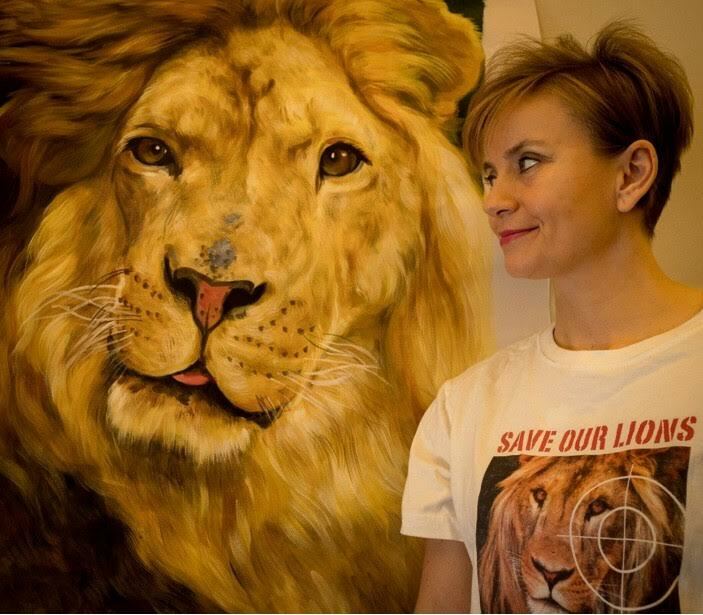 She is confident to raise more awareness about canned hunting in Germany – a topic that is currently unknown to the general public. Since many volunteers originate from Germany, it is paramount to spread more information about the lion industry in Southern Africa. Faye has a bit of a hair fetish, so apart from her 5 Norwegian Forest Cats, male lions are her favorite animals. However, since she can refrain from cuddling lions, she does not understand that hunters cannot have the same discipline and refrain from killing. It is all in the mind! Faye will be travelling as a volunteer to Drakenstein Lion Park later this year and hopes to meet Ares, her favourite lion. However, the only cub she will be petting is her toy lion!